Three teenagers died on St Patrick’s Day. Lauren, Connor (top right) and Morgan (bottom right) died in the crush. POLICE OFFICERS IN the North have arrested two men in relation to the deaths of three teenagers who died in a crush ahead of a St Patrick’s Day disco. 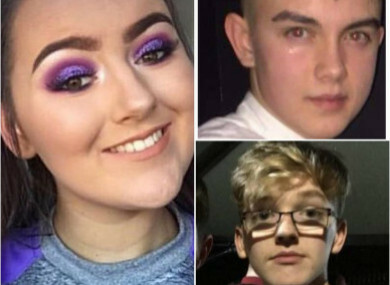 17-year-old Lauren Bullock, 16-year-old Connor Currie and 17-year-old Morgan Barnard lost their lives in the incident outside the Greenvale Hotel in Cookstown, Tyrone on Sunday night. An earlier version of this article stated that the man had been arrested on suspicion of corporate manslaughter. The PSNI released an amended statement at 6.15pm clarifying that the men were, in fact, arrested on suspicion of manslaughter. Email “Two men arrested on suspicion of manslaughter over Tyrone nightclub tragedy”. Feedback on “Two men arrested on suspicion of manslaughter over Tyrone nightclub tragedy”.